Imina Technologies SA announces today the successful installation of the new load-lock compatible Nanoprobing SEM Solution at the University of Rennes 1, France. This solution is another step towards simplification and acceleration of electrical measurements at nanoscale. Imina Technologies SA announces today the successful installation of the new load-lock compatible Nanoprobing SEM Solution (PL16-4B-V) at the University of Rennes 1, France. The system has been installed in a JEOL JSM-7100F scanning electron microscope at the shared microscope facility C.M.E.B.A. / ScanMAT. Professor Jean-Pierre Landesman, the director of the Physics Institute at the University of Rennes, is very excited by the potential provided by the combined use of the miBot™ nanoprobers and the SEM. He stated that "several parameters have made the installation of nanomanipulators in our SEM very challenging. The microscope being shared between several teams at the university and by external partners including private companies, it is crucial to ensure full airlock compatibility of the manipulators and, at the same time, to guarantee an identical microscope operation when they are not used. 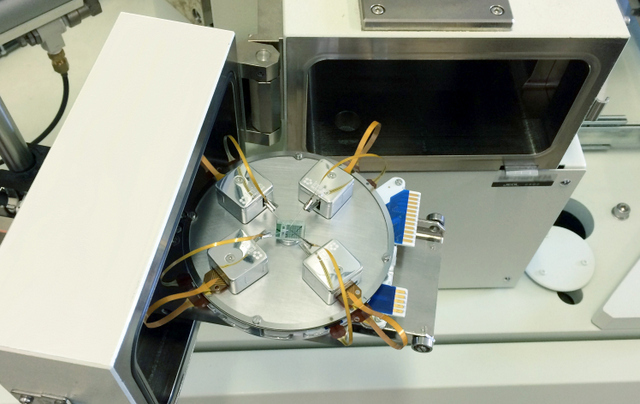 Moreover, we looked for nanomanipulators versatile enough to handle and characterize multiple types of samples. We found in Imina Technologies' solution the perfect compromise between the compactness of the Nanoprobing platform and the flexibility of use of the miBots." The load-lock compatible Nanoprobing SEM Solution is another step towards simplification and acceleration of electrical measurements at nanoscale: "It brings the unique performances of the miBot™ technology to semiconductor failure analysis teams that will save time and gather results with higher throughput by avoiding to break the vacuum between experiments." declared Dr. Benoît Dagon, CEO of Imina Technologies SA. The system will be soon presented on June 7, 2016 at the SCANDEM conference in Trondheim, Norway.